It's Fidelity's Full View feature. 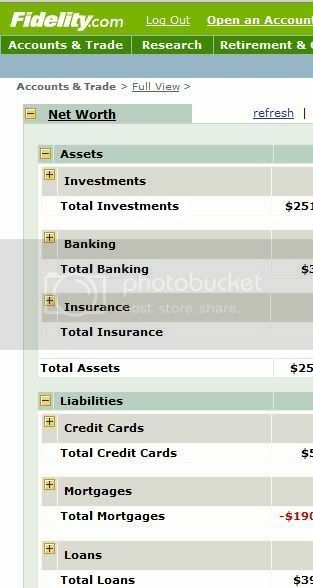 Enter every asset and every debt, and Full View tracks your changes in net worth. I began investing with Fidelity because that's where my husband's company invests his 401K. I continued because it has great research tools. Full View was an unexpected bonus. The downside: Fidelity recently "upgraded" its investment research tool with prettier graphics and less functionality. Tell me about a good online tool for tracking a budget, and I'll consider moving.